Penny Beechman is grateful to take part in the Pain Group in the Mental Health and Addictions Program at Niagara Health. Every Monday, Mrs. Beechman, who has chronic back pain, meets with fellow group participants and a healthcare provider. But while other members of the group are in a room at the St. Catharines hospital, Mrs. Beechman attends virtually through video conferencing at Niagara Health’s Greater Niagara General Site in Niagara Falls. It is difficult for Mrs. Beechman to travel to St. Catharines from her Niagara Falls home. When the Niagara Health team learned of this, they asked if she’d be interested in joining the group through video conferencing using the Ontario Telemedicine Network (OTN). Telemedicine uses telecommunications technology to provide clinical healthcare in Ontario at a distance. OTN is a not-for-profit organization funded by the Ontario Ministry of Health and Long-Term Care charged with building a sustainable and responsive virtual care system. Niagara Health uses telemedicine for patient care in several different programs. The Mental Health and Addictions Program is a leader in this area, having used the technology more than 1,000 times for patient care last year. Mrs. Beechman says she’s thankful for the technology. 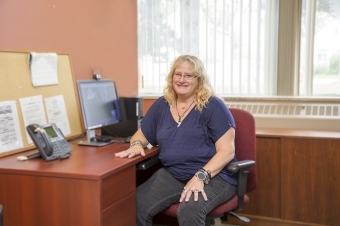 OTN was first introduced in the Mental Health and Addictions Program more than four years ago, so psychiatrists at the St. Catharines Site could consult with patients who presented with mental health or addictions issues at one of our other sites, allowing for more timely care for patients. Psychiatrists who are on call can also use the technology from home, consulting with patients at one of our sites. Dr. Amin A. Muhammad, Niagara Health’s Interim Chief of Mental Health and Addictions, says telemedicine has been a positive experience for patients, their families and staff. The program is continuously looking at opportunities to expand programming offered through OTN technology. The Niagara Health District Stroke Centre at the Greater Niagara General Site in Niagara Falls has been using telemedicine for more than a decade. Here’s an example: When a patient suffering a stroke is brought to the GNG Emergency Department, time is of the essence to care for them, which includes being seen by a neurologist immediately. If a neurologist is not at the hospital, they can evaluate the patient virtually through telemedicine from their office or home. The neurologist is then able to determine the next treatment steps for the patient, including the possibility of administering t-PA, a clot-busting drug that may improve an ischemic stroke. Telemedicine is used extensively for patient care within Niagara Health’s Oncology Program. For example, Niagara cancer patients requiring consultation with a medical expert at another cancer centre in Ontario can connect with the healthcare provider through videoconferencing, reducing the need to travel.